Does attending a lower performing school result in applying to lower performing schools? Conventional wisdom says yes. Certainly in the U.S. context, I’d venture a guess that kids who go to lower performing high schools, on average, attend lower performing colleges. That is, if they attend college at all, which 42 percent of young Americans do not. A new study by Kehinde Ajayi, Assistant Professor of Economics at Boston University, provides interesting insight into this question. Her work looks at process of applying to secondary schools in Ghana. That country has a national, centralized process which uses a standardized test to have 150,000 elementary school students annually apply to 650 high schools. Students may apply to up to six schools, ranking their preferences. After applying, they take a standardized test, the BECE, which determines their qualifications. Test scores are sent to their top choice school. The school will look at all the students who applied and take the top performing students based on how many slots they have. Test scores of rejected students are then sent on to their second choice school. Schools then compare new candidates to their existing pool – again taking the students with the highest test scores. Etc. So if Student A and Student B have the same score on the BECE, and Student A is from a low performing school while Student B is from a high performing school — Student B will generally go to a higher performing high school than Student A.
That’s for students with the same test score. Ajayi emphasized that if anything the gap is underestimated in the above. 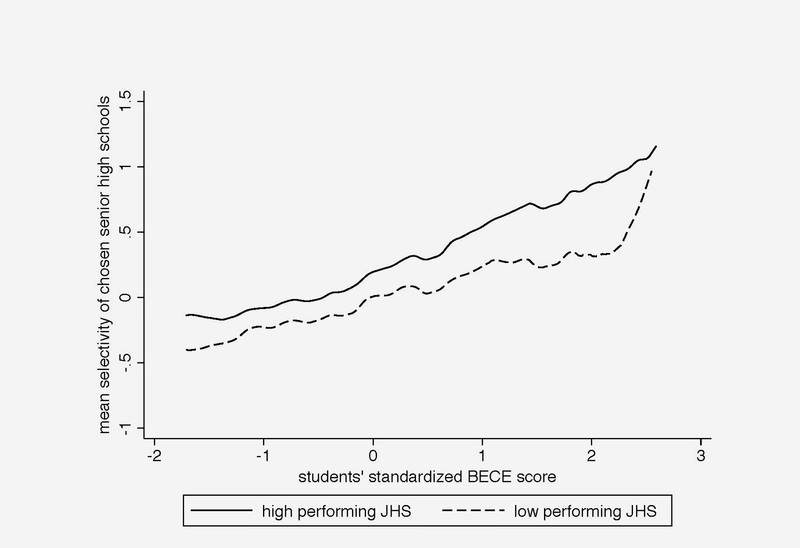 Students from lower performing school tend to have few resources and less “test prep” access – so Student A, from the low performing school, probably has a higher innate ability than Student B who got the same score while attending a higher performing school. Ajayi found a number of reasons for this gap. For one thing, students from lower performing schools tend to be less saavy about their application choices. While the “selectivity” of schools is not fully public, students from higher performing schools seem to have a better sense of which schools are more competitive and tend to have a better developed strategy of the order to apply in. Students from higher performing schools are also more willing to travel – about 40 percent of schools have options for boarding. Perhaps most interesting, Ajayi examined the effect of policy changes on the gap. In 2008, Ghana changed the increased the number of schools students could apply to from 4 to 6. This widened the gap, as saavy students from high performing schools were more likely to get into a school of their choice. Students who exhaust their choices are administratively assigned to unsubscribed schools – which had previously resulted in more students from higher performing schools being randomly assigned. In 2009, Ghana made additional policy changes. They assigned each school to one of four ranked categories and implemented standards for how many schools from each category a student could apply to. This helped narrow the gap as students from lower performing schools now had better information about the selectivity of the schools they were looking at. Reflecting on these findings, Ajayi warns of the unintended impacts system-wide reform can have, saying instead that targeted interventions – like increasing information, financial aid, and student counseling – may ultimately be more successful. This entry was posted in Citizens & Civil Society on November 20, 2013 by sshugars.